"saving nickles saving dimes, working (it!) til the sun don't shine"
This is not a bayou. There are no alligators here, only ducks and the occasional Ibis. I have never seen a bayou (except when I watched Elvis in King Creole on the telly when I was little) but in my imaginings this is how a bayou would look. Today I am wearing a Tre Fiorin 100% polyster frock (although it looks more like a nighty to me). It is made in Italy. There are grande canals in Italy but not bayous. I've seen photos of handsome-ish men (depending on your taste in men) wearing striped t.shirts in canals, but no alligators. Day Eight of Frocktober, I've run out of poses and things to say. Please throw a few nickles, or dimes, or fiddy cents at me. Please help The Ovarian Cancer Research Foundation fund their research. To date, with Bernice's and Tania's generous donations yesterday we have raised $1265.50! Yay! I'm for the Linda R version. My Dad used to sing it. She's a bloody class act, he'd say. He's a bloody class act himself so he'd know. As for alligators in canals, I know not of such things but I always think of the scary little person in a red hood when I think of Venice canals a la creepy. I can't even get your images to come up so I'm only reading it for the padding and padding right back atcha. Fiddy cents in the mail. Got the picture at last. 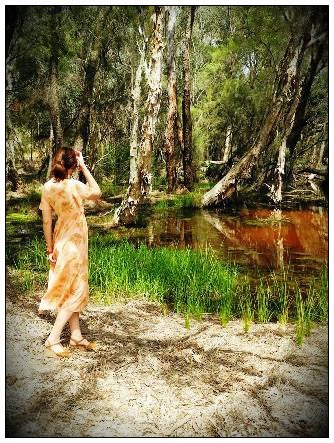 Looks very ethereal in that swamp. I agree with Max. Also don't you have crocs over there in your pretty swamps? I agree with Max too. You're too funny. Beautiful photo, Kylie...and, yes, bayous can look very similar. I emailed you several photos of bayous in southern Louisiana and southeastern Texas so you can get an idea of what's representative of the areas I'm familiar with. The Big O is a beautiful singer but Linda Ronstadt gets you in your heart strings. I have an album of Linda Ronstadt singing traditional Mexican songs with her brothers and her voice is AMAZING! Shared your frocking adventure on my blog today Kylie.